Located on an 18 acre east Manhattan site, the new Trump Hotel & Casino is set to open soon, or, as “The Donald” said “As soon as we can get the beds in the old offices, and the slot machines & crap tables in the auditorium”. 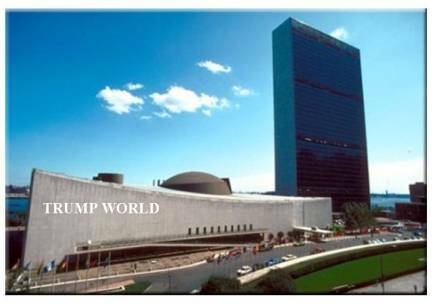 Using a new “United World” theme, the Casino will feature marble steps, gold colored waterfalls, and the same carpet, which is a gigantic map of the world, now has large 3’ tall gold “pushpins” wherever Trump owns property. The flags of nations lining the main entrance were replaced with the Trump coat-of-arms. The entrance to its new eatery, the World Peace Restaurant, now sports a sixty foot L.E.D TV screen with rotating pictures of hungry shoeless children and Trump Hotels to the backdrop of the dulcet tones of Louis Armstrong singing “What a Wonderful World”. Kelly is referring to the long standing problem of “Diplomatic Immunity” and parking scofflaws in NYC.